Hello, glad you found us. We planned for this adventure for almost a decade before setting off. What did it take to sail off into the sunset? We worked hard, paid off the house, took classes, sailed whenever possible, retired early, then bought the boat. Along the way, Joe and I also adopted our grandson, Ethan, who will be traveling with us. Joe Barrett (Captain, Engineer)- After a successful engineering career, Joe recently retired early from a major Semiconductor Manufacturing company in order to realize his dreams of traveling the world by sailboat. Of course you know that Joe’s mechanical engineering degree will come in handy fixing the boat when things break. I asked Joe what he wanted to say in his blog bio, his reply was that “my role is to show up with the bags of cash, and fulfill my wife’s every wish.” Smart man! Joe first started sailing back when Sailing 101 was a PE elective at his high school in Dana Point, CA. During his college days at UC Berkeley, Joe enjoyed sailing on San Francisco Bay, though not perhaps when the fog rolled in. Ten years ago, Joe got bit by the sail cruising bug after some nagging prompting by me. After reading Herb Payson’s classic cruising book, Blown Away, Joe realized that if Herb could sail to the South Pacific, so could he. 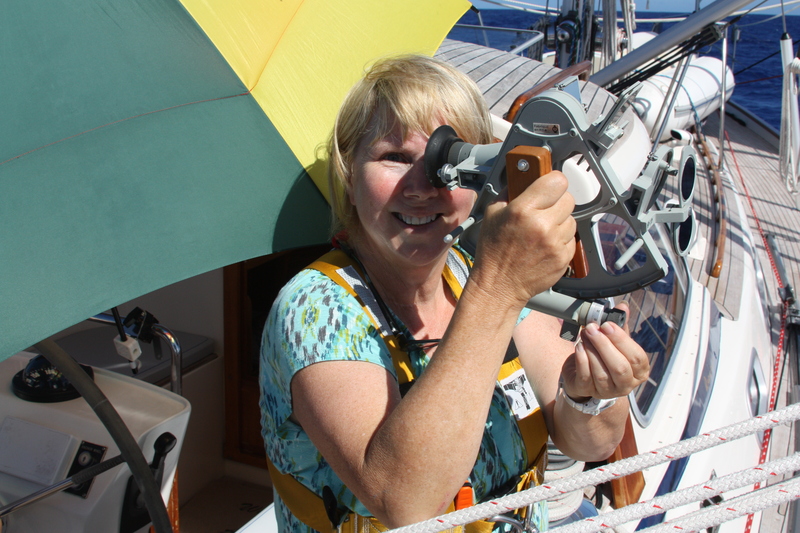 Carla Barrett (aka First Mate)- I discovered my love of the ocean after numerous yacht deliveries with my sister, Yvette, and brother-in-law, Capt. Dave. Dreams of cruising followed, but it took me awhile to get Joe on board. Once he was, the planning began. Prior to cruising, I taught machine quilting, mixed media and design classes both online and at international machine quilting shows. I am an avid collector and beachcomber, so have beads and jewelry supplies on board for when I must be creative. Ethan at age 7 enjoying the beach. Ethan Barrett (age 8) Ethan loves roller coasters, water parks, volcanoes, legos, and making new friends. He is very social, happy and outgoing little guy who loves to meet friends of all ages. Ethan will be boat schooled during our travels. Love reading about your adventures!!! Cann’t wait to catch up with you one day. Super cool! We are shopping for a blue water boat to take sailing across the Pacific with our kids. We are currently in San Clemente and have a boat in Dana Point Harbor! Hope to see you out there. Joe and I’s first date was at Dana Point Harbor! Love that area! Have you found your boat? Keep it coming, carla. Your trip is the only one I’ll ever take 🙂 Glad to be included ! So good to finally get on your site and see how your summer went! We met in Spanish Wells (Andrew, Holly, Summer, and Quinn). You were kind enough to give a tour of your boat and let my kids play with Ethan. Enjoying your posts, safe travels! Hello Andrew! So good to hear from you. We sure did enjoy meeting your family at Spanish Wells. Ethan also loved meeting Summer and Quinn and having them visit the boat. Would love to follow you back, do you have a blog or website? Joe is flying home from the Bahamas today. He went out to prepare the boat better for hurricane season. Say hello to Holly and the kids!